This is emoji writ large. The Fühl-o-meter/Public Face is an interactive art installation that calibrates the mood of the city in which it has been erected with a monumental illuminated Smiley. The work of artists Richard Wilhelmer, Julius von Bismarck, and Benjamin Maus, the urban emoticon accurately communicates its host city’s gefühlszustand according to “mood data” obtained using integrated software which analyzes photos of the faces of passing pedestrians and processes emotions out of them. Mechanical armatures modulate the face’s expression in real-time, making it appear by turns happy, sad, or apathetic with corresponding gestures (smiley, frown, and blank). 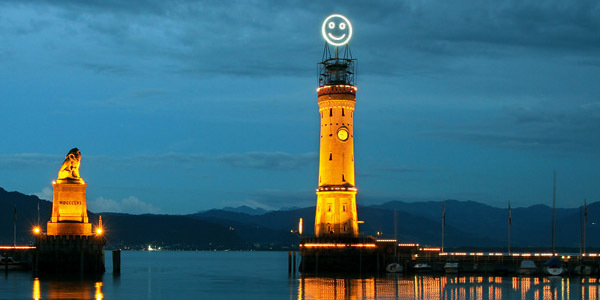 The Public Face was installed on top of a lighthouse on Lindau Island last year, but we hope that it’s rebooted and sent to other cities around the world. Not that it would prove especially insightful, given that most cities are downright miserable. Here’s to the perpetually blank stare of Williamsburg!